Good day. I want to apologize to my readers who have left comments for the past few months and not seen them published. I realized recently that Blogger has not been notifying me that people are leaving comments. I don't know why; I have double checked my settings and nothing has changed, but for some reason, beginning around March, when people leave comments pending my approval, I have not been getting notified and hence not approving anything. I had kind of noticed I was not getting any comments and I just assumed it was because people had finally realized I am a crummy blogger and given up on me. I'm happy to discover it was only a glitch. At any rate, I have not figured out how to fix it. I am currently logging in to Blogger a few times a week to look for pending comments and approving them. I have also retroactively approved all your comments going back to March. So, if your comments have not been getting through, please accept my apologies. Things will get better now. Pax. 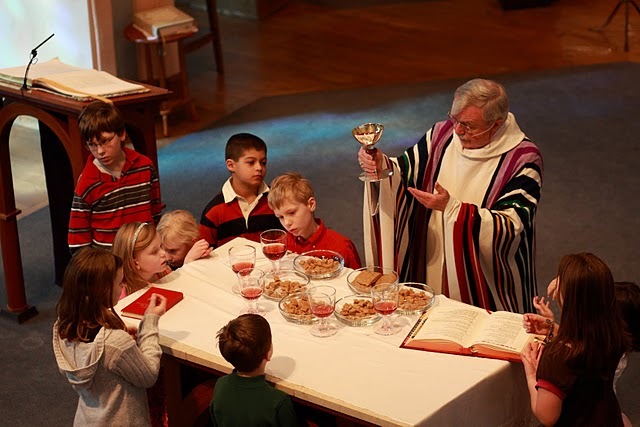 A major problem with widespread liturgical wimpiness is that it cripples the evangelical efforts of individual Catholics who are attempting to win their friends to the faith. I know a person who is open to the Catholic religion. They are kind of curious, but they don't know a lot about Catholicism. But they are open. Nice starting place. Now ideally, if they are curious, my first impulse should be to tell them to go check out a Catholic Mass to get acquainted with what the public celebration of our faith is all about. However, this individual lives in another country (another continent, actually) in a part of the world whose liturgies, shall we say, don't have the best reputation. I certainly don't know the local scene; I don't know how to recommend what parish they should go to. Even if I did, does that look good for my witness to be like, "Yeah, the Catholic faith is the truth and Catholic means "universal", but I wouldn't recommend going to 90% of the parishes around you. Go to this one, specific parish that I found for you after an exhaustive search." That sounds so lame and I feel lame having to do that. It is lame. Now, at this point the conservative Catholic jumps in ready to help and says, "It's not up to you to convert them. Just send them to Mass and let the Holy Spirit do the rest. If they aren't impressed, it's because they don't UNDERSTAND what's going on. You see, friend, they need to be EDUCATED about what the Mass really is, about the Eucharist, and about the liturgy. Once they KNOW what's happening, they will fall in love with the Mass. Here's some books by Jeff Cavins and Mark Shea." Okay, I appreciate the sentiment. One certainly has to understand what one is doing in order to dive in to it; you can't love what you don't know. Before one can even will to learn about something, that thing must first grab one's interest by some inherently attractive element. Knowledge can make things more interesting, but before you desire to acquire knowledge you must have some initial interest. But why would I want to learn about something was unable to generate any initial interest to begin with? Something that interests me makes me want to learn more; but does anybody feel a desire to learn more about something that is boring and uninspiring? Has anyone ever sat through a boring professional presentation and thought, "This presentation is boring. Hmm...I think if I learned more about the subject this would be less boring"? Of course not. Being bored and uninspired is the surest way to discourage people from ever wanting to learn more. To bring this back to the liturgy, if I tell my friend to go visit their local parish and they see an ugly, minimalistic building decorated with the most horrific examples of post-modern decor, coupled with a ridiculous, limp-wristed liturgy, sappy music—presided over by a bunch of elderly women—with a pathetic homily by a socially awkward priest where the fundamentals of the Christian Gospel are not only diminished but are absolutely indistinguishable...then, what on earth would possibly possess that person to want to "learn more" about the ludicrous carnival they've just sat through? Why would they ever want to go back, let alone devote the time to reading books and studying it? So, no, the conservative Catholic mantra of "Just learn about what the Mass is" doesn't help; who wants to invest another two hours learning about something that bored them for one hour? Who wants to watch a dull Power Point presentation at work that is ten slides long and then be told that it would be more interesting if you watched another Power Point with 20 more slides? What some people need to get through their heads is that many Catholic liturgies today lack any sense of transcendent mystery and that this sense of the transcendent is what piques a person's interest and makes them say, "Huh. Now that was interesting. I wonder what the meaning behind that was? "—and then they want to learn more. You can't plant a barren garden bereft of seeds and then expect anything to grow upon watering it. I fully expect if I sent this friend to a Catholic Mass at an average parish where they live that they would walk away shaking their head saying, "That was a huge waste of my time" and wouldn't find anything remotely interesting about it. "Oh Boniface, you're just being.........NEGATIVE!!! You're projecting your own dislike of modern liturgies onto other people and stopping them from coming into the Church!" Um...no. I have actually been told this by non-Catholics. I was talking to a Methodist girl I know in Texas about my faith, trying to kind of garner some interest, and she dismissively said, "Psshh...look, I've been to Mass many times. It just doesn't interest me at all." A long-time Protestant non-denominational friend of mine went to a contemporary Catholic Mass and derisively said it "seemed like a celebration of man" and that there was no way he could be nourished by something like that. And you know what my friends? I had nothing I could say back to either one of them. I mean, I could explain that "The liturgy is celebrated differently at different parishes" and "Well you see a lot has changed since the 60's" and offer all sorts of explanations for what they experienced, but at the end of the day I can't argue with their synopsis of what they experienced. So, yeah, the poor state of the Novus Ordo at the majority of Catholic parishes is an active, objective hindrance to bringing non-Catholics into the Church. It cripples evangelization because there is nothing in most contemporary Catholic liturgies to even pique the interest of a visitor and make them want to do the preliminary study that would lead to entering the Church. And it's absolutely useless to tell a non-Catholic who has just disgustedly walked out of a banal balloon and ballet Mass that it would make more sense if they just "studied it more." Like this article? Follow USC on Facebook and subscribe to our YouTube Channel.